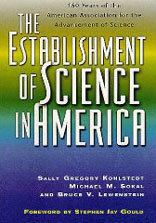 This book provides a comprehensive history of the American Association for the Advancement of Science (AAAS), the largest and most significant general organization of scientists in America, provides a unique window on the development of science in the United States during the past 150 years. The Establishment of Science in America traces the evolution of the role of scientists in American society, public attitudes toward science, and the changing dimensions of the sponsorship of science and its participants. The essays by three distinguished authors connect the AAAS history to issues of continuing importance in American history, such as the integration of women and minority groups into mainstream professions and the role of expert knowledge in a democratic society. The volume divides the history of the AAAS into three parts: Creating a Forum for Science in the Nineteenth Century; Promoting Science in a New Century: The Middle Years of the AAAS; and Shifting Science from People to Programs: AAAS in the Postwar Years. The Establishment of Science in America: 150 Years of the American Association for the Advancement of Science is available from Rutgers University Press.